Mrs. Aisha Buhari attempts to shake Alaafin of Ọ̀yọ́’s hand. Èèwọ̀! [Èèwọ̀ in Yoruba Language is close to, though could be worse than – ‘abomination’. 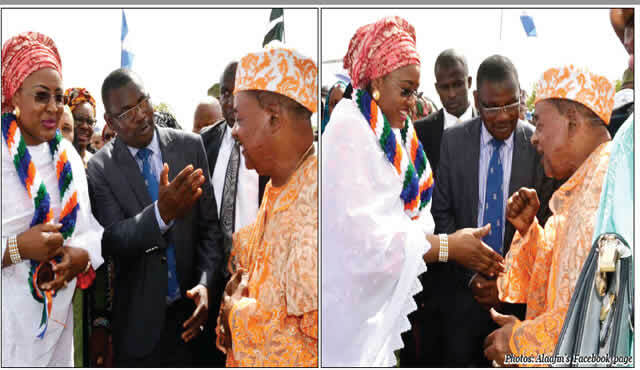 Aisha Buhari is introduced to HIM The Alaafin in the first photograph while she stretches her hand in an attempt to shake the Alaafin’s hand and naturally, she’s rebuffed. For Non-Nigerian readers of this blog, a little explanation is in order. British colonial masters did a lot of damage to traditional institutions that pre-dated their arrival on the shores of the land they would name Nigeria after its conquest which was forced on the Ọba (King )of Lagos, Dòsùmú through, first, what is now known as the cession of Lagos and later amalgamation. Nevertheless, those areas like Yorubaland and much of the North already had great institutions, traditional rulers that sat atop social and political systems. To this day, despite British Indirect Rule that all but dismantled the institutions of traditional rulers: Ọbas in Yorubaland and Emirs in Northern Nigeria, and despite the loss of most powers of traditional rulers, especially since military rule, traditional rulers remain symbols to their peoplethat are highly acknowledged and many are well-respected. State governors love to receive chieftaincy titles from Ọbas concerning whom these same political office holders have the final word on who ascends a throne after the demise of a previous Ọba! While it is true that British rule may have taken away quite some of traditional rulers’ power and, therefore, the imperiousness of top traditional rulers which can now see a governor punish an Ọbas or an Emir by placing them under house arrest or even depose them as late General Abacha did as president when he deposed the Emir of Sokoto, traditional rulers in most of Nigeria, including the East, remain respected even though some are loathed. It was the general belief within and outside Northern Nigeria until the Abacha debasement of the Sultan of Sokoto, the first among all Northern Emirs, that Sultan Ibrahim Dasuki was untouchable by ANY political office holders. Many Nigerians believe, and this blogger agrees, that the evil General deposed Sultan Dasuki precisely because of that perceived invincibility. Dasuki – father of the self-entitled retired army officer embattled because of billions of dollars purportedly mishandled by him as National Security Adviser to former President Jonathan, became perhaps the first Sultan to be ever removed from office. Today in Northern Nigeria more than Yorubaland and definitely more than other areas of the country, the Emirs, including those of villages which, in Yorubaland would be mere Baalẹ̀ – sort of elevated chiefs – are not only respected but feared. The much-disputed 2006 census of Nigeria puts Daura LOCAL GOVERNMENT area’s population at 224,884, i.e. Daura town as well as other settlements in the local government area. I do not know Mrs. Buhari’s town but Daura is the hometown of President Buhari, a fact that gets mentioned here because anyone who is familiar with the North knows that as small as Daura is in comparison to many southern cities and towns, Mrs. Buhari would never offer her hand to Daura’s Emir, not to talk of Emir Sanusi of Kano. It would be a stretch to imagine her offering her hand to 60-year old Sultan Abubakar of Sokoto, and it definitely would not be because of the Islamic religion to which she and those rulers belong but it would have more to do with how they regard and treat their traditional rulers. Two foremost Yoruba traditional rulers, (L to R), the new Ọọni – HIM Ọba Ogunwusi, Ọ̀jàja II and HIM, Alaafin of Ọyọ́, Ikú Baba Yèyé Ọba Adeyẹmi III. Nobody can offer hands to be shaken to either the 40-ish Ọ̀jàja II – he won’t take it, humble though he is, nor to the 77-year old Ikú Baba Yèyé! I knew a retired army Lt. Colonel who, though junior to a Brigadier, was once greeted with deference in my presence. I was stunned, but he was a prince just as I can recall seeing the aides of an Emir whom I would later learn from an Abuja hotel front desk as the Emir of a small town, chase people from the hotel passage. I moved to a side, refusing to run as the aides attempted to make everybody at the passage do; they waited in vain until the Emir got out of his room and walked by. The respect that Northerners give to their Emirs and other traditional rulers which must show in the way Mrs. Buhari acts when she appears in audience to traditional rulers from other areas, especially one as highly-placed and regarded as the Alaafin. I’m sure she knows that, and – permit me to say- it is arrogant and an insult to act as she did. Aisha Buhari is a Nigerian, the wife of a politician, not a foreigner, and there’s no reason why the so-called ‘protocol’ staff, as being campaigned by some on social media, need to tell her what to do. 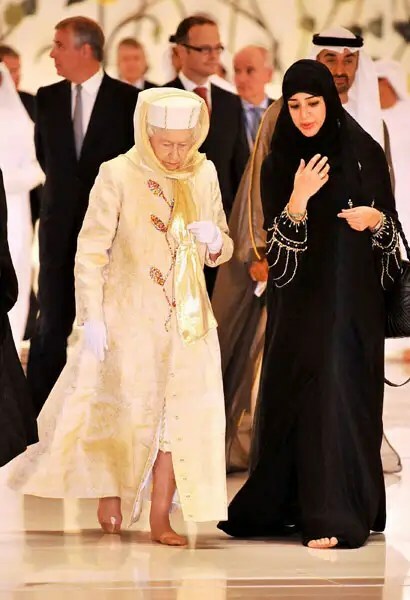 Elizabeth II, Queen of England … and Head of State of England, does not only tie a head scarf but she would take off her shoes to honor the tradition of areas she visits. The Queen – head covered with a scarf and barefooted – and, perhaps, a Sheika in a Middle East mosque. Mrs. Buhari, if you would not respect traditional rulers of other areas the way you would back in the North, it would be better to stay away. I’m certain this opinion reflects that of millions of Yorubas. The story of Aisha Buhari’s behaviour when she visited Alaafin, Iku Baba Yeye can only be summed up in the Yoruba axiomatic saying, “À ìfi ‘ni pe ni, à ìfi ènià pe ènìà l’o mú ará oko sán bàntẹ wọ̀ ‘lú”! It’s always a pleasure hearing from your end, Dear Mr. Afunleyin though I’d love to have your opinions more often! A Hillbilly in American-ese; an up-country person in Nigerian-ese; ara òkè in derogatory Yoruba for country bumpkins … showing up in the city with his loin cloth tied on shows the utter disdain he has for city folks! That’s something LIKE what Mr. Ajipeya said; I’m never able to do justice to his deep Yoruba each time he throws it around on this blog. Most very very well said, Tola. I agree with you 300%! I enjoyed Mr. Tao’s well reasoned, wise response. I am not sure if the Alaafin deserves any blame in this matter, though. If HH were to move to shake my hands, fist pump me, embrace me or tap me with his ìrùkẹ̀rẹ̀, I’d still be caught on my knees. That any person of African descent needs to be instructed apropos this protocol is a mark of how far we as a people have fallen. It reminds me of those bygone days when Igbo people came to work for my father and other cocoa farmers as annual labours. We were usually warned not to expect any obeisance as it was against Igbo culture. But guess what? It turned out be false. Culturally, Igbo people also paid obeisance. The first group to arrive at our doors was led by a very tall, imposing elder called John. He didn’t prostrate, but he went on both knees to greet my father every morning. Some of the younger ones bowed, but noone ever motioned to shake my father’s hand. 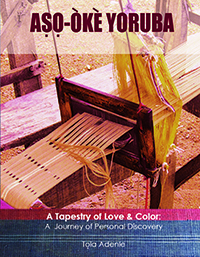 Thank you for your contribution, especially the insight into another culture. I think it is important that Mrs. Buhari learns from this faux pas and ensure she avoids such in future. Michelle Obama touched Queen Elizabeth and the British forgave her. I believe Madam Aisha Buhari should be constantly reminded about the protocols involved in greeting various traditional rulers. Otherwise, her ignorance, not defiance, should be forgiven! The fact that we need to move on and forgive is very correct even though as you also noted, future re-occurences should be prevented by presidency protocol staff who should educate her on how to act on such occasions. People like this blogger are of the opinion that Africans generally need no lessons for such occasions but that is after the fact. The comments of ‘Remi’ is also noteworthy. In 1977, I first argued that all Africans, on contact with West Europeans suffered almost irreparable PSYCHO CULTURAL DAMAGE…an affliction and condition still rampart amongst us and the primary cause of all this misunderstanding, misinterpretation and root of misgivings surrounding the Alaafin of Oyo. (HIM) and Aisha Buhari(FL). The two and their soldiers are caught up in roles which they don’t understand and which are being constantly mismanaged because Africans play caricatures of and do not fully understand WESTERN EUROPEAN AND NORTH AMERICAN (WENA) MODERNITY. If all concerned better understood the roles of the HIS IMPERIAL MAJESTY/FIRST LADY….someone somewhere ought to have prepared and briefed both armies what to do what to say on encounter. Is HIM an Emir ? Why is he approaching FL with a clenched fist in the foto? Will Aisha put out a hand to her village uncle much less her village chief much much less an Emir or Sultan? IGNORANCE MOUNTED ON CONFUSION!!! Both the HIM and FL am sure are courteous and well brought up individuals trust to the fore of modernity , and meant no harm to each other or the cultural contexts in which they have found themselves. Sheath all swords learn lessons ensure that protocols are established,taught as is in the WENA cultures you all caricature. Ancients and moderns will always clash but these clashes are usually and can be civilly managed with proper rules better understanding and professional briefing by protocol officials on all sides. When you are going to meet European monarchs or elected officials of significance ,you are guided in these matters….hand shakes, contact etc. Did anyone , has anyone done this for both HIM/FL.??? If HIM was wagging his IRUKERE in his right hand instead of the misfitting clenched fist..the window would not have opened…..for.confusion all round!!! In the court of Ethiopian Selaise , lesser mortals were told not to turn their backs on the Emperor, Queen Elizabeth of the English addresses herself as ONE ,never I. etc. These socio political artifacts once understood and observed by those willing or obliged to participate in the drama, NEED NOT CANNOT OFFEND! This low burn FARCE, is of the same genre as the OSUN niquab tuss…….a sad ,unnecessary deviation from,and high cost neglect of the harsh realities waiting to be better managed: our place as caricatures of WENA modernity, and more important the failure of leadership in creating a KNOWLEDGE SOCIETY; without which , Africans will remain victims to poverty and ignorance….is there a harsher combination? O se aaro Monday,Tola! Ka pade layo o. You put it all well; nothing else to add.